Let's be honest. Neither Mom or Dad are pink people. 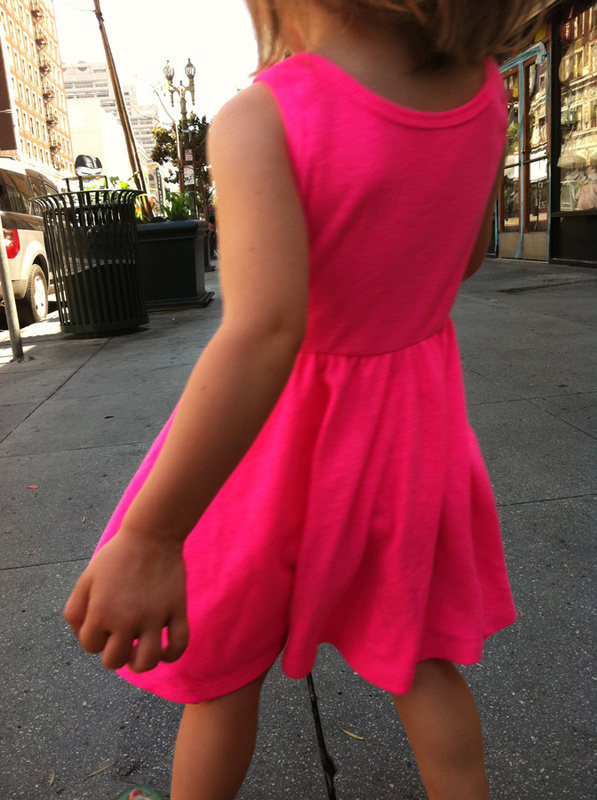 And despite our efforts toward gender neutral clothing, this girl sometimes pursues pink with a laser guided color seeking missile, like when we ventured into the American Apparel factory store in Downtown LA. Even though this dress could be spotted from space, and may possibly glow in the dark, I can't help but love her in this. And yes, in regards to the last photo, she did wrap chains around the neck of her lion and push him back and forth. Surely Stella chose this dress in an ironic kind of way. I love the vividness of this dress in contrast with the grime of the city. You know she knows. Cheeky little bugger. That sweet Stella. Cannot even believe how old she is looking. Can't wait to see you all next week! So very sweet. I love how we end up surrendering on the stuff that doesn't matter (pink). Oh, I can't wait to squeeze her. I'm not a pink person either (outside the fact that Dad got me a pink luggage bag for identification purposes!). My granddaughters somehow inherited a pink gene in spite of Grandma G or their moms non-pink preference. She looks gorgeous in her pink dress. Maybe I'll end up being a pink person after all :). Love you guys and can't wait to see you soon. Little girls with pink or purple, are kind of like little boys turning everything into a car or a gun! Love the swing she made for her stuffed animal! I think she must mean it in an ironic sense as well. Then again...maybe not. She certainly has a mind of her own and simply cannot be swayed by what mom and dad think;). Love that little Stella, she's awesome. OMGosh, you are going to need to rename her as "Stunning Stella" because that is exactly the word that describes the contrast between her pink dress and her black hair! She has GREAT taste in dresses AND color! Beautiful little gal - must take after her mama? I have only seen pictures of Kari but from the way you describe her, Josh, she is beautiful inside as well as on the outside! She's a gorgeous little girl and, look at it this way - it's a FEISTY shade of pink, none of your pastel, princessy, prissy stuff. And, what else, would one do with a stuffed animal than pop it on a swing!? She is totally rocking the pink. We were the same before we had Hope. Hoping to avoid the pink if we had a girl, and to keep things as gender neutral as possible. Then we had a girl, but she was dead. And suddenly I wanted to drown in a sea of pink. I wanted pink, because I suddenly couldn't have pink. Now that we have our living little girl, I'm all about the pink and we are in fact, drowning in a sea of pink. I am secretly loving every second of it, because all I can think of is all the pink we were cheated of this time three years ago. You guys are awesome parents and Stella is such a beauty. Wondering if maybe, I was to wear a crazy bright pink dress, I could channel some of that inner super childhood power into my being. Gotta love a girl who knows what she wants. She can rock it too! All perfect and PINK and Perfect and small little wonder that she is. Maybe I could tangle my grief up into chains around its neck and swing it back and forth like the lion. I think that tangling up your grief in chains and swinging it back and forth is a pretty good idea.